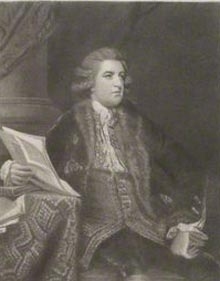 He gained the title of 2nd Earl of Upper Ossory. [S6] G.E. Cokayne; with Vicary Gibbs, H.A. Doubleday, Geoffrey H. White, Duncan Warrand and Lord Howard de Walden, editors, The Complete Peerage of England, Scotland, Ireland, Great Britain and the United Kingdom, Extant, Extinct or Dormant, new ed., 13 volumes in 14 (1910-1959; reprint in 6 volumes, Gloucester, U.K.: Alan Sutton Publishing, 2000), volume III, page 101. Hereinafter cited as The Complete Peerage. [S21] L. G. Pine, The New Extinct Peerage 1884-1971: Containing Extinct, Abeyant, Dormant and Suspended Peerages With Genealogies and Arms (London, U.K.: Heraldry Today, 1972), page 61. Hereinafter cited as The New Extinct Peerage. [S7709] Sandra Snider, "re: FitzPatrick Family," e-mail message to Darryl Roger LUNDY (101053), 3 September 2015. Hereinafter cited as "re: FitzPatrick Family." [S22] Sir Bernard Burke, C.B. LL.D., A Genealogical History of the Dormant, Abeyant, Forfeited, and Extinct Peerages of the British Empire, new edition (1883; reprint, Baltimore, Maryland: Genealogical Publishing Company, 1978), page 210. Hereinafter cited as Burkes Extinct Peerage. Her married name became Stewart. [S21] L. G. Pine, The New Extinct Peerage 1884-1971: Containing Extinct, Abeyant, Dormant and Suspended Peerages With Genealogies and Arms (London, U.K.: Heraldry Today, 1972), page 114. Hereinafter cited as The New Extinct Peerage. [S23] W. H. Oliver, editor, The Dictionary of New Zealand Biography: Volume One, 1769 - 1869 (Wellington, New Zealand: Allen and Unwin and Department of Internal Affairs, 1990), page 130-132. Hereinafter cited as Dictionary of N.Z. Biography: Volume One. Her married name became Sitwell.